Send an amazing proposal to any contact in your Insightly account! Navigate to “Settings” – > “Integrations” and find a Insightly logo. 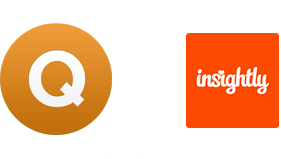 Click to enable the integration, fill in your Insightly API key and enjoy a powerful add-on that will help to create and send great looking quotes. Integration into Insightly syncs clients and contacts between both systems, providing you with access to important information quickly and easily. Now that all your contacts are in Quote Roller, send a beautiful proposal to any client in seconds.